★Feel the inches Melting from your waist: working as a sauna belt, the waist trimmer in special thermal material traps the body heat to increase perspiration and improve metabolism, thus helps LOSE EXCESS ABDOMINAL WATER and BURN BELLY FAT over time. You may literally feel its heating up around your waist area and working on your tummy fat! ★Wear it and Forget it: made of so far the best Latex-free neoprene in the market–it feels Soft & HIGHLY SWEAT ABSORBENT & BREATHABLE & Odor Free & Easy Wash while wearing directly against skin during heavy sweaty exercises,–which is very important in avoiding potential side effects as chafe, itchy or rash caused by cheap fibers. ★Designed for sports and can be WORN DISCREETLY under normal clothes or sportswear, it WON’T ROLL UP and is perfect for both regular workout routines as cardio sessions, and daily physical activities as walking dog or doing housework. 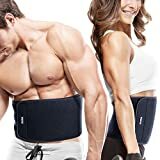 ★Get the Extra Bonus: despite the trimming effect, it OFFERS SUPPORT FOR LOWER BACK and helps with back injuries prevention, posture correction, back pain and muscle strains relief, and it also keeps your stomach and back warm in cold seasons. ★Invest once for lifetime durability: Buy from FREETOO, and get our lifetime guarantee for a lasting waist trimmer that will NEVER WEAR OUT OF SHAPE over heavy use. It’s a ONE SIZE FIT ALL belt with A-level Velcro hook & loop that withstands 50000+ times sticking test without appearing to be fluffy, and is fully adjustable to fit waist circumference between 29-43inches (73-110cm). If you do exercise, do it with a waist trimmer with real sauna effect! Feeling your tummy heating up and seeing yourself soaked with sweat after workout, you could never be so sure that you are making steady progress for better shape and health. ★Top Sweat-absorbent: being capable of keeping your waist area dry even when you’re completely soaked. ★Quick Dry: takes as few time as transportation from gym to home to dry. ★A-level Velcro: can bear 50000 times more sticking test, and won’t go fluffy under heavy use. ★Integrated Design with Invisible Velcro Hook: more slim, easier to apply and adjust for better fit. ★Wider design to cover the whole stomach area for better heating effect and back support. ★Detail-oriented: soft and smooth binding at upper and bottom edges avoids uncomfortable strangling feeling under compression; and neat stitching contributes to better durability. Be caution not to machine wash, dry-clean, or iron. Please stop using this item if rashes develop or you’re sensitive to neoprene materials. Our trimmer features a tactile-grid surface along the inner lining designed specifically to prevent slippage during high-intensity workouts. Intuitive fastening system is easily adjustable and fits almost any waist size. Made of high-quality 100% latex-free neoprene and features ‘soft’ Velcro hooks for improved product durability. 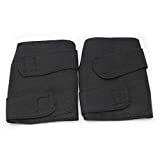 Effectively retains body heat to increase perspiration around the waist and lower back which results in an improved ‘trimming’ effect around the targeted region. Compresses and supports core muscles for enhanced performance while reducing fatigue and strain. Wear directly against skin for optimal performance. Designed in the USA. Manufactured in Taiwan.